When he first announced his three-word solution for the Kashmir dispute in April 2003, Atal Bihari Vajpayee seemingly sounded different from his predecessors. Years later, as his political phrase got repeated for mere blitz, the clichéd troika was reduced to mere rhetoric. Two years after the Kargil showdown, as war-stores stockpiled at the frontiers in 2001, the armies of the two hostile nations desperately awaited the green signal to unleash hell. Behind the warlike situation was an audacious attack on the Indian Parliament. Sensing a potential nuclear outbreak in the sub-continent, the White House and 10 Downing Street got involved, and soon tasked their emissaries to send a strong message to both India and Pakistan. “The United States and the United Kingdom stand ready to help both countries to start a process aimed at building confidence, normalising bilateral relations and resolving outstanding differences, including Kashmir,” a communiqué dispatched from Washington said. That directive came as the joint statement issued by U.S. Secretary of State Colin Powell and British Foreign Secretary Jack Straw on March 27, 2003 from Washington. The statement gave the pressing roadmap for the two neighbours. What happened soon after that joint statement is quite intriguing and simply deflates the so-called ‘visionary’ and ‘statesman’ cult created out of the poet prime minister known for his one-liners. As Indian premier, Atal Bihari Vajpayee had to oblige it, despite India’s position of being against third party mediation on Kashmir. Atal Bihari Vajpayee with Nawaz Sharif before the Kargil War. Back in the valley then, a ‘healing touch’ regime was at the helm of affairs. The former congressman whose conduct as the first Muslim Home Minister of India had made him a kind of pariah, was back to relevance, thanks to his daughter’s grassroot politics. It didn’t take Mufti Mohammad Sayeed as Chief Minister of Jammu and Kashmir much time to set the stage for Vajpayee’s Srinagar visit. On April 18, 2003, Vajpayee came to address a public rally in Srinagar. Unlike the bile he showed for Muslims over Gujarat riots in 2002, he had arrived as a peace activist in Kashmir. “The dialogue should take place on the basis of justice and in the framework of Insaniyat [humanity],” he told a cheering crowd managed by Mufti’s party. Mufti Mohammad Sayeed (left) with A B Vajpayee. This was coming from the man who as a Prime Minister had openly boasted about his “Pracharak” roots, and who once termed RSS as ‘my soul’. As a Bharatiya Jana Sangh member, the young Vajpayee was the first to bat for the abrogation of Article 370 way back in the early 1950s. Even during the 1992 Ayodhya incident that had Kashmir on the edge, his speech left nothing unsaid about his political inclinations. In that mad violence, a few Kashmiri lives were consumed too. Meanwhile, the US-UK script worked. Soon as Islamabad led by Prime Minister Mir Zafarulla Khan Jamali reciprocated to talks offer from New Delhi, the war clouds dispersed. By November 25 that year, a ceasefire announcement had restored some uneasy calm on the frontiers. With the Vajpayee-Musharraf joint SAARC statement from Islamabad in January 2004, the dialogue process had begun. With that, Vajpayee’s deputy LK Advani was face-to-face with the Hurriyat Conference, the outfit then being ruled out by New Delhi regime as an irrelevant body “enjoying no popular support” in Kashmir. Even as the NDA-I engaged the Hurriyat two times that year, it never fulfilled the terms it made in the deal. Soon as the party lost power, it started showing its true colours. By re-launching its inherent bile against the so-called “peace process”, BJP began its Pakistan bashing all over again. LK Advani with Hurriyat leaders. In between, Vajpayee made an unceremonious exit from politics and spent a life of a recluse. 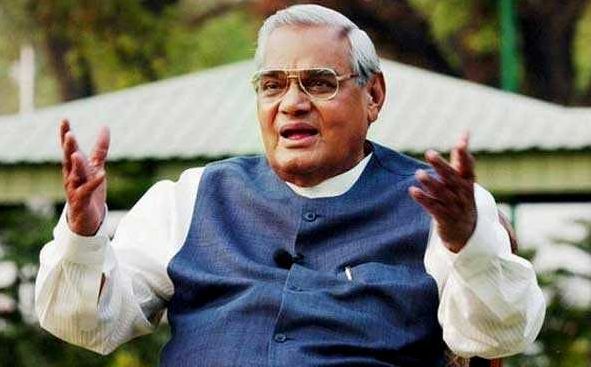 Later, when his phrase was repeated and rebranded as a political panacea for the people of Kashmir, especially by regional parties like PDP, Vajpayee made a reluctant comeback to public memory. But lately, as Modi invoked him from the ramparts of Red Fort, he shortly breathed his last. With his departure, his three-word solution given in the backdrop of the Bush-Blair directive forever became mere rhetoric.